Sacha Baron Cohen fans might cheer The Dictator’s arrival. Everybody else should remain calm and carry on. PC Jabs: The supreme manager of the vegan feminist cooperative grocery store (played by Anna Faris) claims she is so non-racist, she hasn't dated a white guy since high school. All of the employees are political refugees and the use of hurtful language is not allowed in the store. Music: Arabic covers of REM's Everybody Hurts and 9 to 5 sound great. Crocs: The foamy shoes adorning Aladeen's supreme feet are declared "the symbol of a man who's given up hope." Borat: While this reviewer thought Borat would've been funnier had it placed Borat in a fictional country, the movie's commercial success has reportedly resulted in a Kazakhstan tourism boon. It'd be interesting to see an in-depth study of those tourists, identifying their knowledge of the country beforehand, their expectations going in, and their perceptions afterward. Regardless, "nice" would be one of the words not used to describe Nursultan Nazarbayev, Kazakhstan's president. But he's not exactly a nuclear-minded jihadist, either. 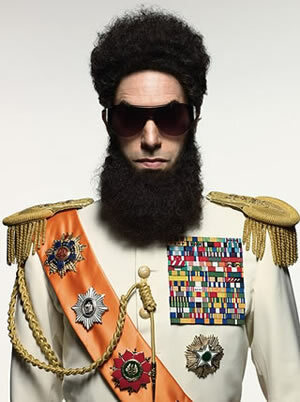 Admiral General Aladeen (Sacha Baron Cohen) is the malevolent dictator of Wadiya. He’s a madman who hangs out with the likes of Kim Jong-il (rest his malevolent dictatorial soul) and has provided Osama bin Laden with a place to hide out (it was, after all, bin Laden’s double who was assassinated at this time last year). All of Aladeen’s friends have nuclear weapons, so naturally he wants his own. He can’t keep a straight face while giving public speeches about how his country’s nuclear experiments are strictly for medical research and clean energy. Behind the scenes, he can’t keep a solid staff of scientists. The attrition rate is high given his all-consuming demand to control every detail, right down to the mandatory pointy-shaped tip of the Beard of Doom rocket. If betrayed, offended, insulted, cross-stepped, or otherwise annoyed, the subject of his wrath gets executed. At least that’s what Admiral General Aladeen thinks. In reality, Aladeen is an idiot. Nobody respects him. And his executioner is a rebel ally who sends those to be executed to Little Wadiya in New York City, heads still firmly attached to fully-functioning bodies. Aladeen finds out all about this while visiting Manhattan in a trip that goes awry. It all begins with an assassination attempt that places a beardless Aladeen on the mean streets of the Big Apple. Homeless and without the wares of his dictatorship, he takes a job at a vegan feminist cooperative grocery store. The store, it turns out, has a contract with the very same hotel where Aladeen is expected to hold a press conference. Needless to say, all sorts of mayhem ensues. As with his breakout smash, Borat, Sacha Baron Cohen continues his penchant for being an equal-opportunity offender. But, while Borat: Cultural Learnings of America for Make Benefit Glorious Nation of Kazakhstan made fun of the very real country and people of Kazakhstan, with The Dictator Cohen wimps out and places his titular character in the fictional country of Wadiya, a “republic” which has encroached on portions of Ethiopia and Somalia. Surely Cohen balked at placing his fictional dictator in a real country, say Iran or Syria, for a number of very real reasons and certainly one of them would be a fear of becoming the next Salman Rushdie, with a fatwah on his head for directly insulting people who are well known to be lacking a broad sense of humor. But Cohen still pokes fun at the big names of the dictatorial world. The movie begins with a dedication, in loving memory, to Kim Jong-il. And there are jabs at other political oddballs, such as Iran’s Mahmound Ahmadinejad (“he looks like a snitch from an episode of Miami Vice”). The Dictator’s comedic escapades careen between the subtly smart and the blatantly stupid. The overarching story of working in a grocery store and the on again/off again nature of its hotel contract feels oddly sitcom-like (the movie’s troupe of four scribes includes three writers from TV’s Curb Your Enthusiasm, also a staple of director Larry Charles’ résumé). There are also heavy doses of raunchy humor and Cohen’s oftentimes grating presence calls to mind Adam Sandler. But amid the low-brow stupidity there are moments of ingenuity, at least to some degree or another. There are other scenes that make one question why certain choices were made, but in a legitimately creative, thought-provoking way. For example, in one scene, a bevy of four buxom prostitutes are sent in to entertain Aladeen’s double. Every bit as stupid as the real Aladeen, he has no appreciation for sexual adventures. That’s a big point of departure from the “real” Aladeen, however, who has a huge collection of Polaroids plastered on a wall in his Wadiyan palace. There are Polaroids of Aladeen posing with celebrities he’s either poked or fondled, including Lindsay Lohan, Oprah Winfrey, and Arnold Schwarzenegger. The real Aladeen may be malevolent, but he still wants to snuggle. Anyway, there’s a golden opportunity to display eight boobies, but the frame is cropped such that nothing is revealed; it’s merely a tease. But then, later in the movie, male genitalia zoom right into the camera lens. Perhaps the one scene that best sums up The Dictator involves Aladeen trying to sneak his way back into his hotel room via a grappling rope spanning across a busy Manhattan street. His wheel rig stops just shy of the window and he’s left dangling. His nuclear advisor and on-the-spot suspension rope specialist advises he empty his pockets; piling on the danger, a pet goat in his hotel room has started to nibble on the rope hooked to the window sill. Out go a water bottle, three bananas, and two bricks, but it’s not enough. Ultimately he unloads a poop from within his supreme ruler robes. As it happens, a purse snatching is happening at that very moment directly below the dangling dictator. Who gets pooped on? The victim. The criminal runs free, purse in hand. That’s a funny, wicked, even sickly ingenious example of modern comedy that is still faintly reminiscent of Harold Lloyd. Scenes like that, though, are tempered with other scenes that try the patience, such as a helicopter tour of New York City Aladeen shares with a middle-America couple. His Wadiyan chatter of 911 (in reference to the Porsche model) and Osama Bin Laden being a house guest land him in jail. Funny? Not so much. Given its abbreviated 80-minute run-time, The Dictator still manages to wear thin by the time the end credits roll. That’s preceded by a speech that calls out America’s double standards, putting Obama, Cheney, Congressional leaders, and a duplicitous voter bloc on par with all the other dictators of the world. There’s some truth in that biting bit of satire. Had there been more of the satire and less of the crudity, The Dictator would’ve reigned supreme indeed.